“King of the Mountain” photo by Walter Chandoha . Walter Chandoha passed away January 11, 2019 at the age of 98. His career spanned 75 years and his photos were published in the most popular magazines and newspapers in the country as well as used by the advertising agencies of Madison Avenue. His photos of his first rescued cat began winning contests, his work was noticed, and he became the expert cat, dog and animal photographer, then moved on to gardening and photographing gardens and flowers, publishing 33 books before his death, with book number 34 to be published in April. A widower of his beloved Maria, he is survived by his children and grandchildren and his cat Maddie. One of my idols without knowing, I realized I’d seen Walter Chandoha’s photos of cats everywhere, as well as of other animals. He was so popular in the 1950s and 1960s that likely his photo alone helped sell the cat food and any other product where one of his images was used in an advertisement. He also photographed dogs and other domestic and wild animals and gardens as well as New York City street scenes, shot when he was an apprentice and later a student in New York City. Nearing 100 years old he was still chasing cats around his New Jersey farm, and still photographing them too. Born in 1920, Chandoha taught himself quite a bit about photography reading books at the library and just after high school was recommended to apprentice with Leon de Vos, a New York City commercial photographer, then in order to make a living worked with a commercial portrait chain. Through WWII he was a press photographer, then attended the NYU School of Commerce for a degree in marketing on the GI Bill. And his next move in the early 1950s led him to a change in his projected career path. One winter evening he found a grey kitten in the snow, put the kitten in the pocket of his army mackinaw and gave the kitten as a gift to his wife, Maria. I have a copy of his book Walter Chandoha’s Book of Kittens and Cats (Bramhall House, 1963) full of stunning black and white images of just that, and comments and information on himself. He and his family had moved to the 46-acre farm in northwest New Jersey in still rural Hunterdon County where he still lives. Many cats as well as other animals and a love of gardens supplied Chandoha with subject matter for many of the 200,000 photos counted in his career. That was in the days before spay and neuter was a viable option for small animals like cats, so mothers with kittens were a common sight. His introduction to the 1963 book has so much to say about his career in photography and photographing cats, and about the love he and his wife Bebe had for cats through the years, and tales of their home with cats, their children growing up with cats in the bassinet, the many litters of kittens. The book is organized as “a pictorial biography of the cat”, from day one to the last day. Nearly seventy years ago they were talking this story, and even then Chandoha quotes a list of “enemies of birds” published by the Audubon Society where cats are number 8—humans are number 4. But, oh, the photos! Most of them his own cats and their kittens, and his children running , playing, wrestling, snoozing, and lots of mama kitties with lots of kittens. It’s well worth it to find a copy of this book either in the library or at a yard sale as I did and just enjoy the photos. Don’t forget to visit Chandoha’s website to read more about him and see even more photos and read the post “Lessons from a Master Cat Photographer” in Times Videos. You can also find posts sharing vintage and newer photos on his Facebook page. 1959 ad for Puss ‘n Boots cat food with photo by Walter Chandoha. I love to study old advertising and graphic design—the fonts, the layout, the images, the offers. Advertising is a little snapshot of who we were in that moment in time. When you put some cats in it, especially prize-winning photos by renowned animal photographer Walter Chandoha, I’m totally occupied. What a find these two ads were when I was set up at Carnegie Antiques for an event! Judi’s shop is always good for cat things partly because cats have always been popular in little figurines and because Judi is a cat person who tends to find them. Ad for Puss ‘n Boots cat food. Displayed on the open door of a wall cabinet I saw, first, pictures of cats, then noted they were two vintage magazine ads for Puss ‘n Boots cat food. They had come to her with a purchase of varied materials from an estate. Neither of them have any identification as far as which magazine they were cut from or even a date but they were well kept, only slightly yellowed. I researched them and found the one at the top, which ran in 1959 in all the major magazines of the day, but no information on the second though it was probably of the same era plus or minus a year or two. Ads earlier than 1959 typically had illustrations rather than photographs and were more often in black and white. 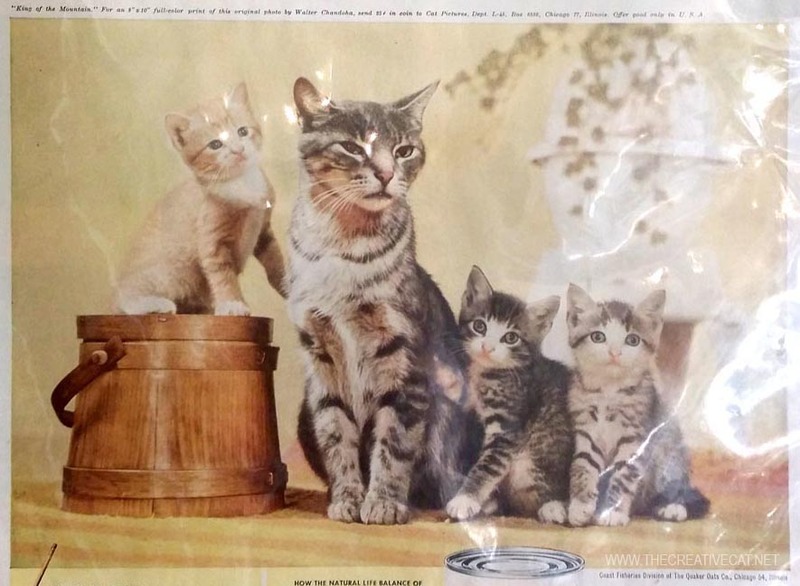 I found it interesting that there would be a full-color, full-page magazine ad for cat food in 1959. I actually remember feeding my cat Bootsie Puss ‘n Boots canned cat food from the big 15 oz. cans in the late 1960s but of course, in those days, if I read cat food labels it was not with any particular awareness. Let’s look at the claims the ads made, very interesting in light of our discussions of pet food today. The food breakdown from the ad. “Costly fillets” using the whole fish, organs, glands, bones and flesh, a nice touch, but also “select cereals” for regularity. It’s interesting to see how canned cat food developed, why fish was such a popular ingredient, and when and why grains were added. The offer for the tiles. And of course, special offers, the key to the success of an advertisement and to marketing your brand in general. Both ads have an offer to receive a print of Walter Chandoha’s photo by sending “25 cents in coin”. The set of four tiles offered in the ad. I did not buy the ads—I have no need for more cat things, and I’ve seen them in other places as well, and also found them on the internet. You can read more about Walter Chandoha in his obituary. Feline Photography inspired by rescued cats from Portraits of Animals! “Sophie Keeps an Eye on Things”, from back when I first took the photo! I’m no Walter Chandoha, but my felines inspired me too. You can see my photos on The Creative Cat every day, and a gallery of the most popular on Portraits of Animals. Prints are available from all of them, even greeting cards and note cards too. Visit my gallery of feline photography to see what’s available. Thanks for sharing, Tabbies. 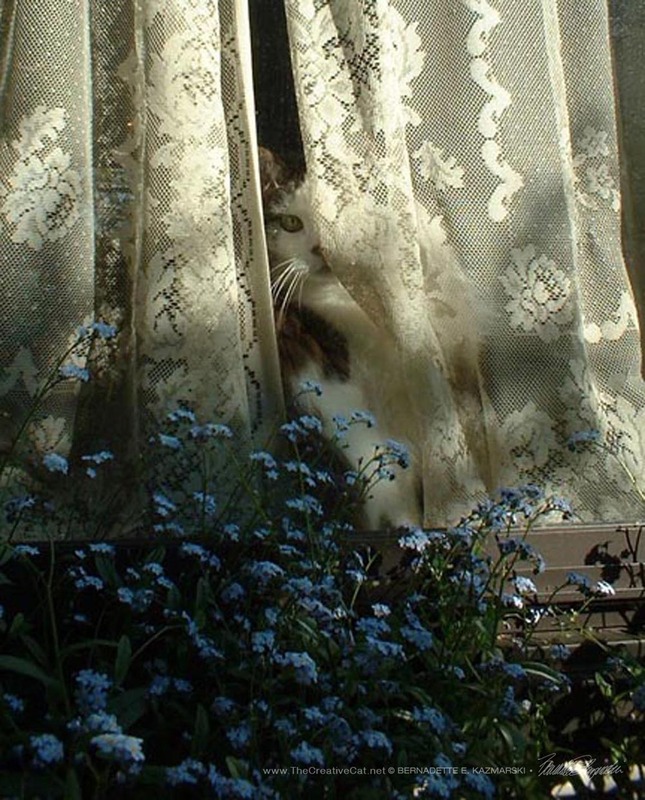 I still find such inspiration in his cat photos, and his flower and garden photos too. I usually come to my used books when the library clears its shelves of extra copies. I’m first on the list for any cat book!